This stuff is intensely garlicky. Just a few drops seem to saturate a block of mysis. 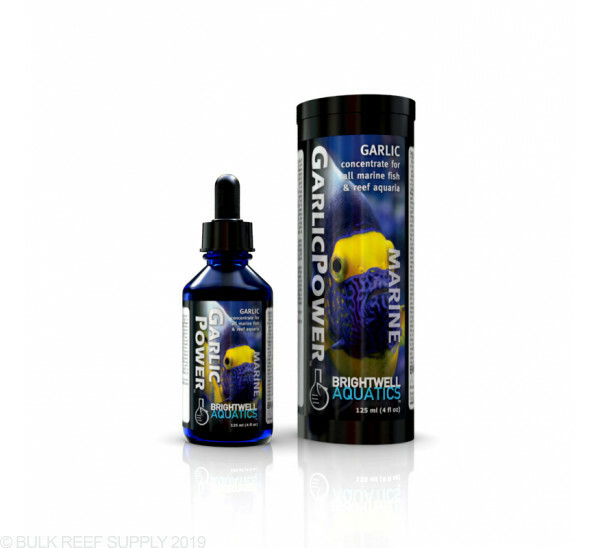 My fish absolutely love anything with garlic in it, so it's great to be able to supplement garlic on foods that don't have it. I used this product to soak my frozen brine shrimp in when my tang was stressed out, and it lived it! Next day it wasn't nearly as stressed out, and the spots had mostly gone away! So I use little Dixie cups to put my frozen food into...so basically I put water into the cup with the frozen food and this stuff let it set for a few minutes to absorb and then I dump the food into the tank? I don’t think we could have said it better ourselves. Usually we suggest about 2 drops per cube of food since a little goes a long way. We will usually just put a couple drops in right when we put the frozen food in the cup to thaw, and then let it sit and thaw for a few minutes and then feed as we normally would. Great question, and if you have any more just let us know. Thanks! Does the larger size come with a dropper like the smaller version.